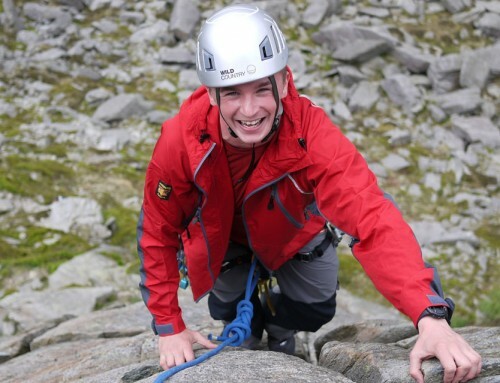 A learn to lead rock climbing course based in Snowdonia for you to learn to lead your own rock climbs. This course runs Monday to Friday and is ideal if you have done a little climbing before, perhaps at an indoor wall, or are new to the sport. We aim to develop your skills from introducing you to belaying and climbing to progressing through to seconding multi-pitch routes involving belaying a lead climber and a second from above. Towards the end of the course you will also have the option of leading your own traditional climbs ie climbs where you place the gear to protect the route. If you join the course with more climbing experience then we can get you leading sooner – the 1:2 ratio ensures that we can run it to your needs. 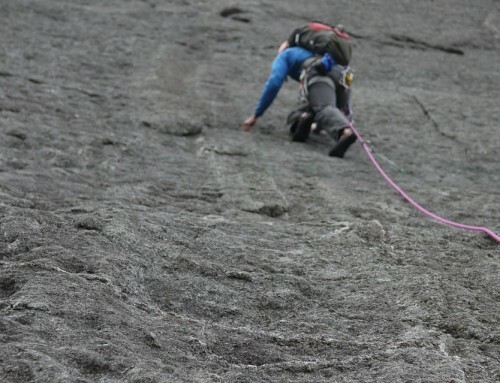 An introduction to belaying from above and below either on single pitch crags or easier multi pitch climbs, dependant upon weather and your experience. We will also look at movement skills, tieing into the harness, tieing into anchors, setting up top rope systems, abseiling, crag etiquette, route finding and crag safety. We head out onto the mountain routes with a view to climbing some of the multi-pitch classics of North Wales. You will consolidate the skills learnt in the first 2 days and we will be able to progress towards leading your first lead climb if you want to. We will teach you how to place nuts, wires, cams, hexes and slings to protect the climb and additional multi pitch skills such as stance management and abseil retreat and climb grades from Difficult to Hard Very Severe to match your ability and aspirations. The key point with this course is that the whole course is run at a 1:2 ratio which allows us to climb in a multi pitch setting all week if we want to and maximises your learning time. The course is taught using my progressive teaching model, click here to learn more. We run the course in Snowdonia. Snowdonia offers every type of climbing from roadside crags to long mountain routes and has its sheltered venues suitable for rock climbing through the winter months (the North Wales coastline being particularly good). We do not include accommodation with this course. For a variety of different accommodation options in Snowdonia, from camping to nice hotels, visit the link on the right of the page. The link also shows road and rail travel options to Snowdonia. Read my article for the BMC on making the transition from climbing indoors to heading outdoors. I run the majority of courses myself. I hold the MIC and IML qualifications and have many years of practical experience of working with a wide range of clients. I am also assisted by other local Mountaineering Instructors who are good friends of mine so that you get a balanced view and some different opinions. I have been rock climbing for nearly 20 years and you can read more about my qualifications and experience here. Hi Rob, I just wanted to say thank you so much for a fantastic week of climbing. I had a great time, learnt loads and loved every minute (even in a strange way the bits that I was rather scared). I really appreciated your patience and knowledge; and also for pushing Jon and I onto more challenging ground. “I wanted to say thanks for another fantastic week, I like it when an instructor pushes his clients to new things if and when they are ready and the sea cliffs rocked including the brazen elements and trumping fog-horn! I have had my chums in stitches regaling that tale already! I will also be checking the Forum on your site anon, as you recommended, to try and see if I can get out and about with others in the coming months. Awesome to have your guidance as always and I hope you enjoyed the Whisky. Just a quick email to say how much I enjoyed the course. It was brilliant. I found it answered all the questions Ive been trying to figure out. Ive been in the mountains now for 3 or 4 years and had picked up so much information but as for the technical side of things this was the one that seemed to of pulled it all together – it was the missing link for me!! Thanks again and see you in the near future! !